It wasn’t long ago that the biggest enemy to television advertisers and programmers alike was the TV remote. Ah, for the good old days. New mobile technologies and platforms have given consumers virtually effortless and instant access to hundreds of competing communication channels. And now we learn that they’re increasingly accessing these channels while actually watching TV—or not watching. Welcome to television’s latest nightmare. The monster keeping brands and programmers up all night isn’t necessarily getting bigger, it’s just multiplying. Two new data sets of consumer research provide valuable insights into how audiences are using media, often at the same time. The behavior is called screen splitting. 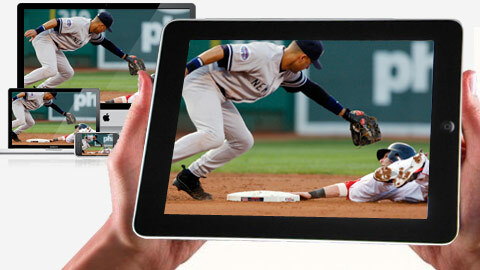 It’s arisen from the explosive growth in mobile technology and even new platforms such as the iPad and tablet computing. The Nielsen Company’s latest survey of connected device owners indicates depth of this new behavior. 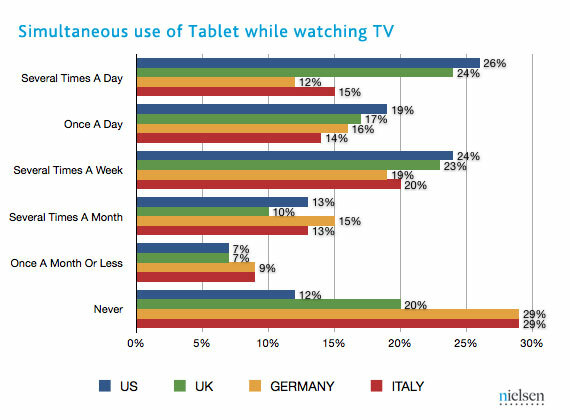 Fully 88 percent of tablet owners and 86 percent of smartphone owners said they used their device while watching TV at least once during a 30 day period. 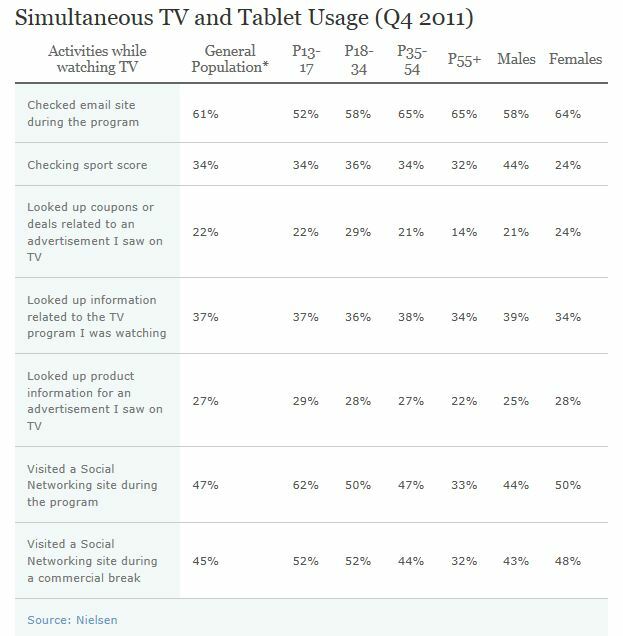 For 45 percent of the American tablet owners, screen splitting was a daily event, 26 percent said they simultaneously used their tablet while watching TV several times a day. (Figure 1) The data was similar for smartphone owners. The second data set suggests the media switching happens at an almost frenetic pace among many viewers. Innerscope Research specializes in conducting biometric studies of consumer viewing habits. In a recent study commissioned by Time Warner, Innerscope outfitted 30 participants with biometric belts that recorded their physical responses as they used media throughout more than 300 hours of time away from work. The participants also wore special glasses embedded with cameras that tracked what platform they used and for how long. The results showed that consumers in their 20’s, or digital natives, switch media venues about 27 times per non-working hour. To put that in perspective—about 13 times per standard half-hour television show or newscast. Older consumers who didn’t grow up with the new technologies, those who Innerscope calls digital immigrants, shifted media at a 35 percent lower rate—just 17 times per non-working hour. Together, the research sets tell us how our viewers are no longer sitting at the table to consume our products. Instead, they’re running through the ala carte line. They’re not eating whole meals, they’re snacking. As soon as the instant gratification wears off, they’re onto the next snack. Figure 2- John Eighmey's Reward Model for explaining viewers engage in and share content. First and foremost, the content must be stimulating. It must be enjoyable to watch, clever, or surprising. Second, it must have an element of empathy or personal identification. Third, it must lack confusion. Fourth, is narrative or theme familiar to the viewer? That is, does he or she recognize the theme or scenario in which the information is presented? Fifth, it must have news value such as a new claim or idea. Finally, the message has brand reinforcement in that it creates positive attitudes about the message or messenger. From a practical and operational mode, strong brands have learned that they must create stimulating content and integrate it 360 degrees across multiple platforms and channels. For Coca-Cola and Proctor and Gamble it’s no longer acceptable to run just a TV ad and a print ad and call it a day. They now know their brand and content has to live in traditional media, social media, digital media—all the channels that their customers use. TV Newsrooms must adapt the same strategy. Some already are. KTTV, Fox 11 in Los Angeles is now routinely using Google+ to involve viewers in “hangouts” with their anchors during the newscasts. The hangout participants can even chat with the anchors during the commercial breaks and watch the behind-the-scenes action in the studio. 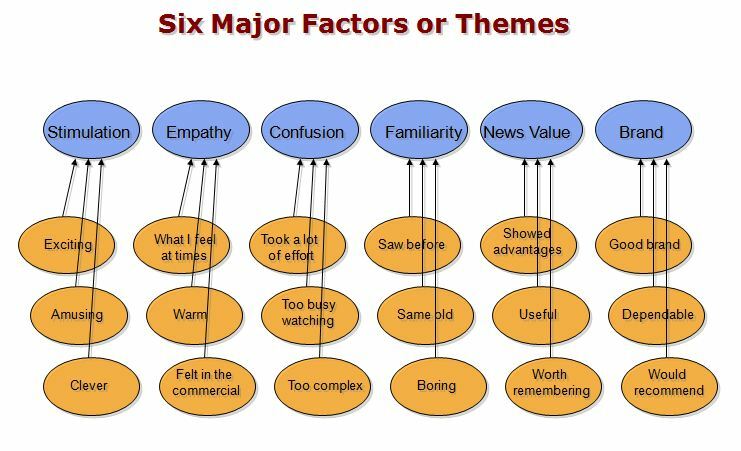 Figure 3 - Nielsen Co.
Reporters should steer viewers to Facebook or Twitter for additional content or pictures (you may lose their attention briefly, but you keep them engaged in your brand). During major stories, or continuing coverage, create a branded hash tag for viewers to follow and interact with. Display the “lower third” super of the hash tag during the related content. Read what other viewers have to say on Facebook. Let followers know their specific content or posts will be used on-air (everyone likes to be on TV, even if it’s a quote). Replace all talent name supers with their social media addresses. Work with station web page designer to display the real time Tweets of reporters and anchors on the home page. It kind of points to the reality that storytelling has never been more important… but what’s troubling about some of the insights from Innerscope is that young viewers are just not engaged by the beginning-middle-end format.